Two building package - #57 is 2 bedroom bungalow that rents for $600 a month. #59 is 3 unit apartment building. New energy efficient boiler in 2015 should provide lower heating expense. Centrally located to major highways, on bus route, and walking distance to all services. Johnson City Elementary Intermediate School Elementary School, High School / Public 3 1.55 mi. Johnson City Elementary Primary School Elementary School / Public N/A 1.55 mi. Johnson City Middle School Middle School / Public 4 1.55 mi. Johnson City Senior High School High School / Public 5 1.51 mi. Blessed Sacrament School * Pre-School, Elementary School / Private N/A 0.59 mi. St. James School * Pre-School, Elementary School / Private N/A 0.65 mi. 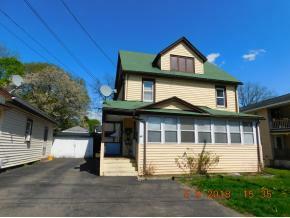 57-59 Albert Street, Johnson City, NY 13790 multi-family home was sold for $120,000.